Course includes EXPANDED 150+ page manual with charts! In this foundational 3-day certification course students will learn the basic hands-on techniques of foot, hand, and ear reflexology through the 4-theory integrated approach to reflexology: structural integration; meridians; zones and psychoneuroimmunology. This innovative whole-hand approach is gentle on the thumbs and fingers and the practitioners body. At end of training student will be able to perform a full hand, ear and foot reflexology session, immediately being able to integrate into their work. $100 non-refundable deposit holds your space. Pricing varies depending on location. See upcoming trainings below. None. Anyone who has an interest in this healing modality can take this foundational course! 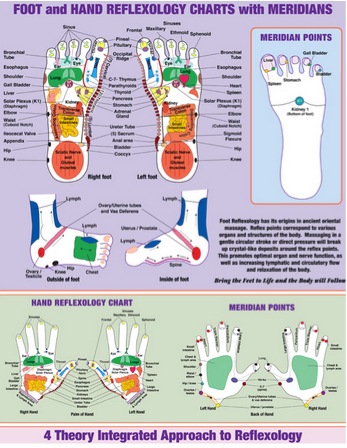 Each participant will locate all reflex points on the feet and demonstrate basic reflexology technique and must show proficiency on an in-class written exam. After successfully passing, students will be certified in Integrative Reflexology.